Home // At The Range // February Schedule – January Classes are full! Ladies – We scheduled two beginning classes this month, January 19th and January 20th, but they filled early. And our next Basic Firearms 101 class on Sunday, February 10th from 1:00 p.m. to 4:00 p.m. is already FULL! So, we’ve scheduled another Basic Class on Sunday, February 17th. For those of you attending our practice sessions, our next gathering is Sunday, February 3rd, 1:30 p.m. sign up. And KUDOS to this family of female shooters. 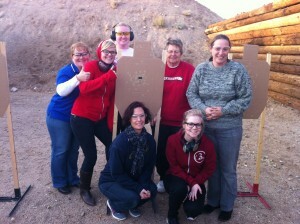 They attended one of our December classes and were ALL most impressive shots! Hope to see you ladies again soon at our monthly practice sessions.